When fast rising actor Joseph Benjamin starred in that N32 million naira block buster, ‘’Tango With Me’’, many industry people and the general public thought his best has come, little did they envisage that they were far from the truth as he shows more versatility, style and panache in this new romantic drama, Mr & Mrs., where he starred alongside the delectable Nse Ikpe Etim. then decides to confine her to the kitchen, a place he strongly believes she belongs. 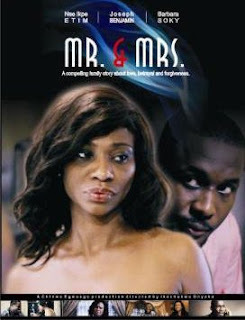 In the same vein, the movie also talks about another couple Linda and Charles played by the duo of Thelma Ojiji and Paul Apel who seemingly have a perfect marriage until Linda begins to take her husband for granted because she takes care of all the bills in the home. The teaser of the movie has already been released and it looks tidy and promises to be interesting with a lot to look forward to in terms of the cinematic affluence, picture quality, storyline and the characters in the movie. In a move which continues to ensure the quality production of Nollywood movies, the movie is shot on the Canon 5D by director of photography Tom Robson and it is expected that the movie will be released around March this year in Cinemas and also on DVD. Will Joseph reignite the blockbuster magic like he did in ‘Tango with me’ when Mr. and Mrs finally hits cinema in March? Time will tell.